Get shutter actuations count of your Canon EOS camera! EOS Inspector displays a shutter actuations count of your Canon EOS camera, so you can easily check whether a newly purchased camera is really brand new, or how heavily used a secondhand item is. You can avoid a visit to a service center by doing the diagnostic yourself. Important details about your camera, such as serial number, battery charge level, possible shots and firmware version are presented as soon as you connect your camera via USB cable. 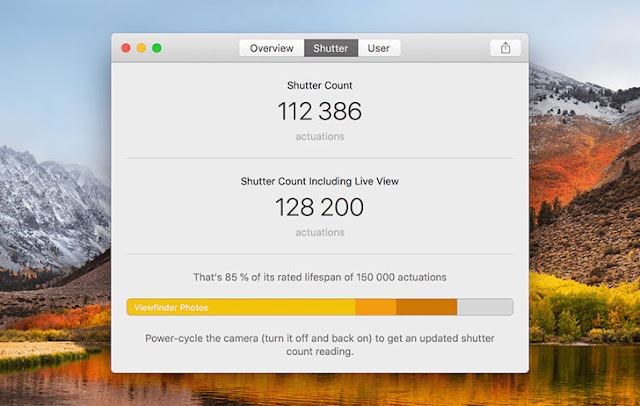 EOS Inspector displays a shutter actuations count along with a shutter’s rated lifespan (that varies from camera to camera) so you can easily see the percent of its wear. For modern EOS cameras Live View related actuations are also displayed. For newer cameras you’ll get even more! Most EOS cameras released since 2015 (such as the 1D X Mark II, 5D Mark IV and 5DS) provide more details on shutter’s usage. You’ll get separate values for photos taken through the viewfinder, photos taken via the Live View and a number of Live View sessions. All these values are presented visually on the detalization bar. Depending on a concrete model, Canon EOS cameras support up to three user-customizable fields that are used to populate metadata of your photos. EOS Inspector gives you a convenient way to change owner, author and copyright settings of your camera. Easily share a report that contains a summary information about your camera such as serial number and detailed shutter actuations info. EOS Inspector is tested and confirmed to be working with 65 Canon EOS cameras, including the recent ones like 1D X Mark II, 5D Mark IV and 5DS. After a one-time purchase you get a full-featured app without any implied restrictions. There are also no in-app purchases and no limits on a number of shutter count readings. Buying or selling a camera online? Use EOS Inspector to determine whether or not the camera that is listed as new is really brand new or estimate/verify the value of a previously used item. Running a camera rental shop? Use EOS Inspector to track different cameras usage to predict failures and estimate costs related to shutter mechanism replacement in future.